Rubber Stamp - Self Inking - Print colours available are BLACK, BLUE, RED, GREEN or PURPLE - Select from the drop down box. 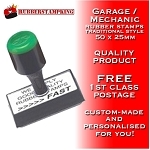 This stamp is ideal for DIY Mechanics who self service their own vehicles. 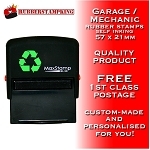 This stamp is an ideal way of preserving your vehicles service history when backed up with receipts for parts etc. Place your order by 11.00am Monday to Friday for same day dispatch FREE by 1st Class Royal Mail.